Internal Revenue Code section 280 is a conglomeration, a potpourri, and a mass of all kinds of stuff that the government decided to dump into one place. Internal Revenue Code Section 280 can be a very confusing subject. Normally, when IRS and Congress prepare code sections, the sections deal with specific subjects. Code section 280 is a conglomeration, a potpourri, a mass of all kinds of stuff that the government decided to dump into one place. The title of IRC Section 280 could have been A Mix of Tax Confusion – Home Office, Commuting Expenses, Golden Parachutes, Luxury Automobiles, Marijuana Sales, Sales of Controlled Substances, and More. This online article covers the different sections of code section 280 that affect a lot of people. Code Section 280 is a mess. An absolute mess. Whoever had the responsibility of writing this code section blew it; blew it horribly. It’s kind of like file cabinets. It’s kind of like desks. It’s kind of like my office. When you don’t know where to put stuff, you pile it on here, you throw it in there, and you forget about it. That’s what they did with this code section. They just buried all kinds of things in there. I’m going to be sharing with you both the law and my interpretations of the law. I’m also going to be sharing with you case studies where these different code sections have been applied, and I’m going to specialize and focus on tax planning tools that you can use. We’re dealing with a lot of subsections in 280. I’m going to be going through A, B, C, D, E, F, G, and H. I’m going to be going through different subsections. The section that has an impact on most people is Section 280A, office in home, the business use of the home. I’m going to be talking about how it is imperative to get every deduction that you are entitled to. I’ll be talking about the fact that when I do presentations with accountants and other tax professionals, and I ask them a question, “How many of you encourage your clients to take an office-in-home deduction?” Very few encourage them, and, very erroneously, many practitioners say that if a client takes the office-in-home deduction, they will have a better chance of having their return selected for examination. That’s false, absolutely false. Actually, the government has basically said “Don’t worry about the office-in-home deduction.” They’ve given you a streamlined method to use. This article will examine business versus rental use allowances, deductions that you’re entitled to. That’s part of 280A. We’ll look at the fact that this section also deals with daycare, when people use their homes, and that there’s a little different allocation method. Part of 280A also covers rental of a personal residence to an employee, where you have your own corporation and you rent to your business, or you even rent to an employee. A major corporation who pays you rent for the usage of a portion of your home. We’ll examine personal use of a residence for short-term rentals, where the government has got a break for you. If you rent your personal residence to individuals for less than a specific number of days, you’re not allowed to take any expenses, but also, you don’t have to include in income the money you receive. That’s a significant benefit. Also addressed in 280A is rental to a family member, and the importance of determining a fair market value rent. We’ll also look at some other code sections, 267, losses between related parties. Also dumped into this section is demolition of structures. Why is that buried into a code section that deals with office in home? We’ll be talking about when you acquire a structure, demolish it, and build something else on it. What do you do with the cost of the demolition? 280C is an offset section, where you disallow deductions when credits are available. You can’t get it both ways. Well, let’s throw in a little bit more about the automobile. There have got to be limitations for luxury automobiles. The problem is, what the federal government says is a luxury automobile is not a luxury automobile in our eyes. It’s a normal, low-priced car, but because of the antiquated tolerances, levels and limitations, you have inconsistencies. I’ll also cover, in 280F, limitations on property use for personal purposes when you don’t use something at least 50% of the time. There’s also a portion of 280F that they’ve dumped into this subsection — treatment of leases. So, in Section 280, we’ve got automobiles. We’ve got offices, office in home, commuting. Now, let’s add golden parachutes. Not parachutes that we see coming down from the sky from airplanes, but golden parachutes that people get money from businesses. And the government has seen that people with the sale of businesses have come out rich, taking it as a business expense, and basically hurting other shareholders. We’re going to be talking about what is a golden parachute. Well, let’s make it a little bit more complex. You see what I’m saying? Section 280 is a dumping ground. Code section 280H, limitations on amounts paid by personal service corporations (PSCs) electing alternative taxable years, limitations on amounts that can be paid, where a personal service corporation has made a code section 444 election. And we’ll explore making 444 elections and how the government treats them, and the limitations that they apply by tying this into another section, limiting deductions for personal service corporations to what people pay for personal holding companies. Again, this is all 280. It’s a mass of confusion. All kinds of stuff. So I’m covering a whole bunch of subjects. Someone says, “All you’re doing is a presentation on one code section?” There are probably 15 different code sections here, but they dumped them all into one. Code section 280E, and the sale of marijuana. Colorado was the first state in the United States to legalize the recreational use of marijuana. California was the first that legalized the medical use of marijuana. After that, Washington, Oregon, Alaska, and Washington, DC followed. We’re not done getting locations, getting states. There are close to a dozen additional states that are expected to vote on the issue of legalizing marijuana for recreational use in the next two years. Why? Because people like using it. Because states don’t have a problem with it because it raises a lot of money in sales tax and other local taxes. States are not like the federal government. The federal government can print money. The federal government can operate with deficits, which they’ve been doing for a long time. The states are broke. The states need money. I live in Indiana, conservative Indiana. We have so many casinos in Indiana, it’s amazing. We were one of the first states to have multiple casinos in different towns. Why? It makes money. 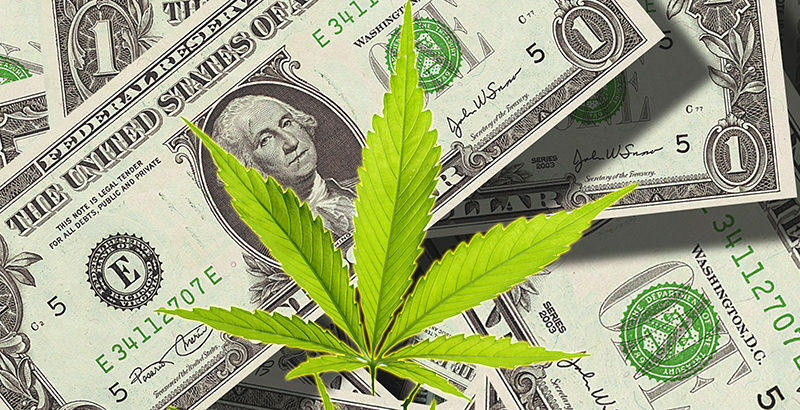 Marijuana sales make money. “Oh, it’s for the people. They want it.” Why are the states doing it? Because they see it as a revenue maker. We don’t have a lot of states now, but there are going to be more states as we go along. Although some states recognize recreational marijuana use — they recognize it, and they voted on it — the U.S. government has not budged. The U.S. government says that marijuana is a controlled substance, and controlled substances are illegal. Are they addressing all this? They do address it in many areas, but what they’re saying is, “States, you can do what you want. You can tax it. You can allow some deductions, but because the federal government still sees it as a controlled substance, we’re not going to allow you to have the same deductions that you could have at the state level.” Regardless of how individual states treat it, according to the federal government, selling or possessing the drug is illegal on the federal level. It’s illegal. Code section 280E has specific language that states that there is no deduction allowed for any amount incurred in a business that consists of trafficking in a controlled substance. Marijuana is specifically listed in Schedule I of the Controlled Substances Act. The same thing as heroin, cocaine, and other drugs. We have a lot of different code sections that apply in this situation. The first one is code section 61, which kind of reads like the Sixteenth Amendment to the Constitution. Income is taxable from whatever source derived, even if it is illegal income. If Al Capone would have filed his tax return, and it included all of his income, the IRS wouldn’t have had a problem. IRS has a line item on the return for illegal income. It’s line 21. The income from the sale of marijuana is includable in income. Illegal businesses must report their revenue. If it’s a corporation, on a Form 1120; if it’s an individual who’s selling it, on a 1040; a partnership, on a 1065; or a sole person LLC, on a 1040. A multiple entity LLC that has not made an election has a default classification as a partnership. They have to report their income and pay the tax liability. But it’s talking about gross income. There are a lot of code sections, like code section 162, that relate to expenses that are ordinary and necessary, incurred in a trade or business, are deductible. But what you’re going to see here is income from an illegal activity, the sale of a controlled substance — marijuana — is not deductible in the same manner. Prior to 1982, illegal businesses were able to reduce their revenue by the normal business expenses, which are the cost of goods sold, the purchases with the adjustments for beginning and ending inventory, and also those other expenses that are ordinary and necessary business expenses—the rent, the marketing, the employee expenses, all of those other expenses that are incurred in a trade or business that are ordinary and necessary under code section 162. In the landmark case Edmondson, the IRS had denied in an illegal business a lot of expenses for lack of substantiation, but the courts in Edmondson said the IRS is not really clear, and allowed Edmondson to claim these other expenses, these distasteful expenses that were related to an illegal business, the sale of drugs. In 1982, Congress, with recommendation from the IRS, came up with code section 280E, and again, they didn’t want to have a specific drug code section, so they dumped it into 280. Code section 280A has been around for a long time. So they enacted 280E to reverse the decision in Edmondson, and what they said was businesses could no longer deduct from their illegal income most of the other expenses that were not cost of goods sold expenses, that were like below the line expenses. They limited the deduction for those amounts. They basically took it away. Cost of goods sold remains so, basically, the cost of growing the marijuana, or purchasing it from the Colombians, or purchasing it from other individuals, would remain as a deductible expense. In 1996, California became the first state to legalize the sale of medical marijuana. In a court case in 2002, Californians Helping to Alleviate Medical Problems, the IRS attacked all these expenses, these ordinary and necessary expenses, the below-the-line expenses, but, in this case, the taxpayer was able to get some of the expenses to be deductible. The court allowed the business to deduct the consulting arm of the business by saying that those expenses belonging to Californians Helping to Alleviate Medical Problems dealt with another arm of the business besides the selling of the product. They also performed other services, and they should be entitled to take expenses. Because they made the interpretation they were not limited under 280E, they were ordinary and necessary under 162. Olive v. Commissioner, a 2011 case. IRS does another examination, and they disallowed not only the below-the-line and ordinary and necessary business expenses, but they also disallowed cost of goods sold. The reason for it was the taxpayer, Olive, didn’t have adequate documentation to prove the expenses. The court listened to the IRS, and saw its position that the taxpayer didn’t have specific, written documentation. The problem that is often occurring with the Internal Revenue Service is the revenue agent, the tax examiner, wants to see documentation in writing. Documentation evidence does not necessarily have to be in writing. Code section 274 requires written documentation, but cost of goods sold doesn’t necessarily. If you could prove it through something called evidence, specifically circumstantial evidence, corroborating evidence, or oral testimony, you’re able to prove. At court, Olive was able to prove that they had to pay something for the marijuana, and they proved the industry average of 75% of gross revenue, that there was a 25% profit in the sale of marijuana based on what you have to pay. You can only mark it up so much. So, what that was telling taxpayers was, get the expenses out of administrative expenses, ordinary and necessary business expenses, and dump it into cost of goods sold. Code section 471. Code section 471 deals with methods of accounting. Prior to 1986, a taxpayer determined its inventory, production and purchase costs using code section 471. They said, in basic terms, that a business that has inventory, and where it is a material-producing factor, the business should be on the accrual method, which means that taxpayers would have to capitalize the material costs, the direct labor costs, and specific and direct costs, which meant that a marijuana reseller would capitalize the invoice price of the marijuana purchase, plus the other charges, the freight. Like any type of business does. Those directly related cost of goods sold expenses would go in, and basically, as we know with the cost of goods sold, when you still have the inventory, you have to reduce the inventory. That we have to reduce the cost of goods sold by the ending inventory, but it’s basically capitalized until you get rid of it. So, 471 came into existence. Well, again, we think, “Well, okay. Let’s throw it into cost of goods sold.” While it might be deferred until we get rid of the inventory, we’re still going to get it. It’s better than not getting it at all, because, normally, it’s going to be disallowed because it’s below the line. But here, move it into the cost of goods sold, and even though it’s sitting there with inventory you’re holding, eventually you’re going to get it, the deduction. Another code section impacts upon this, code section 263A. Code section 263A basically added additional expenses that are inventoriable compared to code section 471. Code section 263A applies to a lot of different businesses. Homebuilders and developers who incur expenses have to capitalize those costs, and when they finally sell the homes or the buildings or the land; then they’re able to take the deduction. Well, again, 263A says we’ve got to capitalize it. Code section 263Aa, resellers are required to treat a proper share of indirect costs as inventoriable. Both producers and sellers are required to capitalize inventory and a portion of these general administrative costs. So, still, it’s looking at the idea that we’ll eventually get it, even with 471, even with 263A. However, they made modifications. Expenses capitalized are later deductible, right? Wrong. Because they wrote in 263A2 that for a general and administrative expense, the rent, the promotions, those different expenses, they put a restriction and put into code section 263A saying that any cost, which could not be taken into account in computing taxable income for any taxable year, shall not be treated as a cost described in this paragraph. This is the impact of code section 280E. What it’s basically saying is that this is a controlled substance. Code section 280E says, “You can’t take it.” Code section 263A says, “You have to capitalize it,” but they put the limitation. 263A2 came in later to say, “You can’t take it because it’s not a deductible expense under 280E.” So if 280E doesn’t allow it, you cannot get it on 263A2. The impact of 280E. In 2015, the Office of Chief Counsel of the Internal Revenue Service came out with the Chief Counsel Memorandum. Chief Counsel Memoranda are written to tell the IRS how to handle issues. The IRS is going to follow these positions. Do you, as a tax payer have to cite this or have to follow this as authority? No. A Chief Counsel Memorandum, a proposed regulation, the government is going to follow, but you do not necessarily have to follow it. However, if the IRS examines you, you know where they’re coming from. You’re going to have to contest it. Chief Counsel Memorandum reiterates the 263A restrictions for the administrative expenses under 280E. However, they did make some relief for cash method tax payers. Nothing changed for cost of goods sold, but the incidental, general, and accounting expenses, IRS has the authority to permit cash basis taxpayers to deduct from gross income the costs that would have been inventoriable had the taxpayer been on the accrual method. But again, this is more of an accounting method change. It still does not give the taxpayer the right to take the administrative expenses. Tax law is not always fair. What is happening is these businesses are paying a substantial amount in tax. It’s like YOU operating. When you have a practice, you have rent. You have employees. You have promotion expenses. You might have a website. Your gross income is not your net income. You have those expenses. You’ve got to spend money to make money, unquestionably. But, because of the differences in interpretation, 280E is a killer as far as the profitability of marijuana businesses. Will this ever change? I doubt it. I don’t think it’s ever going to happen. That is a look at 280E and the marijuana code section. We’re now going to go back into other parts of 280. Code section 280A deals with office-in-home deductions. When I’m speaking at a professional society or at a gathering of EAs, enrolled agents, I ask, “How many of you encourage your clients to take the office-in-home deduction?” Very few in the room say they encourage their clients to take this deduction. What are the reasons? The first reason they often tell their clients is, “The IRS is going to examine you,” that the IRS computers automatically kick out returns where the deduction is there. Or they tell the client, “You’re going to have to keep voluminous records, documentation. You have to use a whole room for business, always. A whole room.” And they say, “When you sell your home, you’re going to have to recapture your depreciation and pay tax on that.” Because when you sell your home under code section 121, you get to exclude the first $250,000 if you’re single or the first $500,000 if you’re a married couple. So what practitioners do is advise clients not to take the office-in-home deduction, but there are many tax payers that do claim the home office deduction. Taxpayers claim more than $7 billion a year in deductions on their tax returns, either as an employee or on Schedule Cs for home offices. Depending on whether you’re self-employed or an employee, you have different limitations. If you’re an employee and this is part of employee business expenses, it goes into Schedule A and is impacted by the 2% limitation. Schedule C, we have a form, and it goes into the computation of Schedule C, which can have an impact on your self-employment tax. There are some basic rules for office in home. You must use part of your home exclusively and regularly as the principal place of business. It’s not for your convenience. It’s for the convenience of the employer. A realtor who has an office at a real estate office doesn’t like the noise at the real estate office. They can use the internet and realtor.com from their home. They can use the computer from their home. They don’t need to be at the office. They love working from home. They can dress down. They can be more comfortable. That is for the convenience of the realtor. Where a person is offered space and doesn’t use it, it must be for the convenience of the employer. It should be a place that you regularly use to meet or deal with clients. It must be for the convenience of the employer. There was an older case, Cadwallader, a tax court memorandum case from 1989. The gentleman, Mr. Cadwallader, was a professor. He loved to grade papers and do his class plans from his dedicated space in his home. Mr. Cadwallader’s return won the IRS audit lottery and was selected for examination. The IRS agent said, “You don’t need to have this office at home.” The court denied the office space to the professor because the university provided adequate office space. He chose to work from home. This is very important to understand. This is broader than just office at home. The concept of ordinary and necessary. An expense could be ordinary to have an office, but is it really necessary? Let me give you another example tying into the ordinary and necessary type of thing. This one will surprise you. There was a tax professional who loved to go to resort conferences sponsored by his CPE provider to get his CPE credit. And the tax professional limited the conferences that he attended. He went to only international locations in resorts and took the airfare, took the hotel expenses, took all the expenses. This individual got NASBA, National Association of State Boards of Accountancy, approved CPE. Well, his tax return was selected for examination, and the IRS agent looked at the educational expense, which was significant. And the agent made a determination that, yes, CPE expenses are ordinary; however, it was not necessary for you, every single year, to go out of the country for your CPE. Because the same program that you’re going out of the country for is being offered in your own town, by the same company in the United States. So, therefore, while it was ordinary, it wasn’t necessary. It’s the same concept with an office at home. While it might be ordinary, is it necessary when you already have adequate office space? You’ve chosen to work from home. There are all kinds of expenses, uses of entertainment expenses. Someone says, “Well, I had to entertain this client.” IRS has the right to say, “Well, it’s ordinary to entertain the client, but the expenses were lavish and extravagant, and it was not necessary to spend that money to do it.” Is the government superimposing their judgement on me? Yes. Do they have a right to do it? The answer is yes. There is a lot of confusion. A lot of people say, “You have to use a room entirely for business.” No, you don’t. You have to use the space of a room or the whole room, but not necessarily the complete room. On the other hand, would the government go paranoid if you had a futon in your office, and you had a family member come in there and sleep on it a couple times during the year for a couple days? No. The government is not going to take away the deduction from it. Multiple rooms may qualify. You’re going to see a case study I’m going to be discussing, a real case, that in an office in home, you can claim more than one room. There are exceptions to the exclusive use test. If you’re storing inventory or product samples in a room, even though you’re using the room, you’re going to be able to get the deduction. In a daycare facility, where people are taking care of kids in the home, the kids have to use the bathroom. You have to use the kitchen to prepare the meals. People live in the homes. Is there an exception for daycare facilities? Yes. Now what if a person spent their time doing day trading? They traded like crazy. They used their computer. They bought and sold securities all the time. They had one room dedicated to their investing. That room was not used for anything else. That should be an expense on their return. That at least should be a Schedule A code section 212 expense. You still have to meet the 2% limitation. It’s deductible, right? Wrong. Office in home is only allowable for a business, not for investment purposes. It is not an IRC 212 expense. You can’t take a deduction for an office in home used for investment purposes, which is going to be passive income. It must be used for business, either as an employee in a business or for your own business. There is an exception. Let’s look at a case study. Again, I love teaching through storytelling. It bothers me immensely when all people do is recite code sections. I like to share real examples. I’ve written four books, and a couple of my books are called mistake books. One of them is called The Top 50 Mistakes Practitioners Make and How to Fix Them: Dealing with the Internal Revenue Service. I’ve had this licensed to tax practitioners’ societies, to major accounting firms. I love teaching through a case study approach. I’ve also written another book called The Top 50 Mistakes Practitioners Make in Nonprofit Taxation and Governance Issues and How to Fix Them. Again, case studies. This is a case study titled “Negotiating a Settlement with the IRS” that deals with appeals. This is a true case. I’ve changed the names, but it’s a true story. Also, you’re going to get some benefit from this case study because it will help you know how to go to appeals, negotiate settlements, and serve and defend your client. Louis and Ellen Carpenter operated from their home. Again, from home you can do a lot of things. I operate an international business. I have five people who work for me all over the world, and I work from my home. It’s amazing what you can do. Well, Louis and Ellen Carpenter used the same practitioner for years. They have a small office. Basically, a simple practice. The taxpayers have an adjusted gross income, of about $90,000 a year. No exorbitant expenses. They do itemize their return. They do have a home mortgage, and their itemized deductions are relatively conservative. The accountant interviewed the couple to obtain the information, a fairly simplistic return, and gave the information to a paraprofessional working for the firm to prepare the tax return. Most of the expenses were conservative; however, the accountant did ask some questions regarding the use of an automobile and the whole office-in-home deduction. The Carpenters assured the accountant that they would never cheat the government, that all of the expenses were proper and reasonable, and that they had documentation if they were ever questioned by the IRS. The accountant had exercised due diligence. The accountant didn’t have to examine all of this documentation. They had the right to believe the taxpayer. The accountant prepared the tax return. In January of 2014, the IRS contacted the Carpenters to tell them that their 2012 tax return had been selected for examination. Lo and behold, the issues that are being questioned by the government are the automobile travel expenses and the office-in-home deduction. The Carpenters asked the accountant if the money they paid the accountant for the preparation of the return also included representing them at an examination. The accountant said, “No. I gave you an engagement letter,” which was a very wise decision. I would encourage all of you, when you prepare returns, to tell clients specifically what they’re paying for. It does not cover representation at examination. It does not cover an offer in compromise. Very clearly, tell clients they’re paying only for preparation of a tax return. The accountant felt that this would be a fairly easy examination and that it would take about 10 hours. The accountant told them how much they charge per hour. The Carpenters said they can do it themselves. They don’t need the accountant. Six months later, the Carpenters contacted the accountant to say they made a big mistake. They made a mistake in representing themselves at the examination. IRS tore it apart, disallowed a substantial portion of the travel expenses, the use of the vehicle, and the entire amount of the office-in-home deduction. When a taxpayer does not agree with the findings, they have a right to appeal. The government issues a 30-day letter, which enables a taxpayer to file a protest and go to appeals. Well, the Carpenters reconsidered and asked the accountant to represent them before the appeals office. A tax professional is a person who does things called tax planning, tax preparation, and tax controversy. There are tax practitioners that all they do is tax resolution. They’re the ones that wave the magic wand and make the taxes disappear or get the offers in compromise. This person was a preparer. The accountant had only had two examinations in their career. They had dealt with some collection matters. This was their first appeals case. They didn’t know how to proceed in this situation. There was a mistake. A practitioner, especially now with the revisions to Circular 230, should be competent to do the services that they’re charging for. There’s no shame in being honest with a taxpayer. You should say, “This is the first time.” It doesn’t mean they can’t represent. Maybe someone could help them. Maybe someone could work with them. After the tax pro prepares the protest to the 30-day letter, they will have approximately 60 days before the appeals conference to prepare for the hearing. The tax pro can get copies of the workpapers. IRS can ask for your workpapers, and you can ask for their workpapers under the Freedom of Information Act. And it is not that formal during an IRS examination when you’re sitting across the table from the IRS auditor. When they ask you for your QuickBooks files, you have a right to say, “I would like to see your workpapers.” You’re able to review the information, see if the IRS auditor made a proper determination. Make sure the auditor is citing the relevant law, the appropriate law, the current law. Make sure the determination is proper. The practitioner should spend time interviewing the client to determine what substantiation was presented to the examiner. What kind of records did they give to the examiner? If records were missing, work to find them. If there is evidence that could be presented, oral testimony, corroborating evidence, or circumstantial evidence, you can present that. Be prepared at the hearing, at the meeting, to present the information. In this situation with the mileage deduction, try to find documents that prove the odometer readings. Show proof. Now, with the office in home, the next paragraph is significant. To document the office in home, the tax professional can take photographs of the office area. I personally had a case where a taxpayer contacted me, and the factual situation was as follows. They were examined by the IRS, and the IRS threw out the office in home. The individuals were people who were involved in MLM, multi-level marketing, people who sell Mary Kay, YTB Travel, Noni Juice, Xocai chocolate, all these things. You don’t make money from selling a product. You make money by finding other distributors, other people to come into your pyramiding; but, it’s still a business. Well, the couple were empty nesters. Their children were gone. They had a home about 2,700 square feet, a nice home. I went to their home. I took a tour of their home. They showed me the office. One of the bedrooms was used as an office. Unquestionably, it was an office. So they opened up the French doors, and I walked into the room. Visualize a room with two big sofas. Picture a room that’s a living room with refrigerators. Picture a room with large plastic bottles of Noni Juice, inflatable Noni Juice bottles, and Noni Juice posters on the wall. And they said to me that they use this room to get people to become distributors. I said, “Why did you not claim this as an office in home?” They said, “Because it’s not our office; it’s our showroom.” I said, “You’re allowed to take a deduction for rooms that are used for business.” So I pulled out my smartphone with my camera and took a picture of that room and the office. And then I went into appeals and said, “First of all, they’re entitled to the deduction that was disallowed. Plus, you’re going to give us a refund.” And I explained the situation. I explained the business to them. I showed them the pictures. I provided the documentation, and it ended up they got a refund. I also got them the travel expenses reinstated. A picture is worth a thousand words. So if the IRS is questioning an office in home, don’t be afraid to get a picture. Before the meeting, make notes. Be prepared for the hearing. Have an agenda. Present information. It’s also very important to prepare an in-depth protest. You don’t get a second chance to make a first impression. Explain the misinterpretation. At the conference, start out with an introduction. If the agent made errors, don’t hit them cold at the meeting. Give it to them ahead of time with a protest. It will give the appeals officer time to research the issues. The original auditor maybe made a determination, but there’s a person who’s handling the appeal that can consider hazards of litigation. In the Internal Revenue Manual, it states the following in Part 8, which is the appeals manual. It says, “A settlement may either resolve each issue on the basis of the probable result in litigation or involve mutual concession of issues based on the relative strengths of the opposing positions or the substantial uncertainty of the outcome in litigation.” What are they saying? They can settle cases. Again, you’re providing them documentation. The accountant will be negotiating with the IRS. In any negotiation, you want to create a win-win situation. Don’t ever say to the IRS: “Why don’t we settle on 30 cents on the dollar?” Instead you can say, “I feel my client is entitled to a larger percentage of the deduction.” If they’re allowed a larger amount of a deduction, they’ll pay less tax, but you don’t start with the tax. They can’t settle on the tax, but they can settle on the amount of the deduction. That would give the appeals officer a basis for making a mutually agreeable settlement. If the appeals officer settles it, you’re going to see a Form 870. It’s going to take a little while for them to prepare it. And you should be patient, but you’re going to receive it. And it’s going to follow through with what they’ve told you orally. The law or authority. Part 8 of the Internal Revenue Manual, which you can find by researching the Internal Revenue Manual at www.irs.gov/irm. Public information, you should know what to expect. In this situation, the tax professional should have maybe probed a little bit deeper into the deduction plans of the client. The engagement letter should have been very clear. It doesn’t cover an examination. And the tax professional should take courses on how to handle appeals hearings. How to calculate the home office deduction. Any expenses that are directly related to the home office are fully deductible. Indirect expenses, when you pay for the whole house expenses, like depreciation, like utilities, those deductions are based on the percentage of the home used for business. Now, can you take and incur a loss? No. The deduction is limited to the income of the business plus apportioned home mortgage interest and taxes that you allocate for the business portion. You can also do either a pro rata proportion based on the number of rooms used in business, or you can base it on square footage. It’s your choice. But you do not have to use a room entirely for business. It’s the space in the room that you make the determination. You first determine the home office deduction limitations, which equals the gross income from the business. Then you deduct in this order. First, the mortgage interest, real estate taxes, and casualty losses, direct expenses such as repairs and supplies directly for the home office, then the depreciation. The 2% limitation applies in Schedule A for employees, not for Schedule C.
What is the government saying? The government is basically saying they don’t want to bother with these issues. Honestly, I don’t understand why a practitioner would tell a client not to take a deduction that they’re entitled to, whether you use the simplified method or the regular method. Because a dollar is worth more now. Tax planning is accelerating deductions, deferring income. Yeah, later on when they sell a house, and they don’t take the simplified method, they might have to recapture. But at what kind of tax rate? Take the deduction. What the government is basically telling you with this is the same thing they’re telling you with the repairs and capitalization regulations. I was working with a company, and they said this is the biggest issue they have. They said, “Look at the regulation.” I said, “Give me a break.” What the government is saying is they don’t want to mess around with capitalization or repairs because it’s a waste of time for them. If you capitalize a repair, they’re then going to get depreciation. They might get 179 depreciation, additional first year, taking the whole amount; they don’t want to bother with it. It’s the same thing here. If someone is entitled to take it, don’t worry about it. They created a simplified form for doing it. You may choose to either use the simplified method or the regular method for any taxable year. You choose a method on a timely filed return. Once you have chosen a method for a taxable year, you cannot later change to the other method for that same year. If you use the simplified method for one year and the regular method for any subsequent year, you must calculate depreciation for the subsequent year using the optional depreciation table. There are limitations in how you compute it. This is true regardless of whether you use an optional depreciation table for the first year the property was used in business. There are limitations in how you compute it, but, again, the government doesn’t care. They don’t care about how you’re doing it. You can choose the method. This is kind of like when you take the optional mileage method, a portion of that is depreciation. You don’t just jump around from the actual to the optional to the actual. There are limitations. It’s the same thing here with this depreciation. Another case study. Let’s talk about commuting expenses with an office in home. Here is, I think, one of the biggest mistakes that a representative can make when telling a client not to take an office-in-home deduction. The title of this case study is “Office in home and commuting expenses.” Michael is a manufacturer’s rep for different clothing accessory manufacturers. He works in a large metropolitan area. He gets 1099-MISCs. He receives income through commissions. Michael has been using the same conservative CPA for years, who is very proud of the fact that in 15 years not one of his clients has ever been examined by the IRS. Michael works from home, and uses the Internet. He has a room, a bedroom, dedicated to business. Michael asked the accountant if he should take the IRC 280 office-in-home deduction. The accountant advised Michael not to take the deduction because of the following reasons. It could be a red flag. IRS would be selecting returns for examination. It’s going to take time to keep records. If Michael sells the residence at a gain, he’s going to have to pay taxes on them because not everything is going to be excluded. You have to recapture. Michael believes his accountant and takes his advice. Well, the examiner is required to pick up related examinations of subsequent and prior years that are open under the statute of limitations. He made this into a three-year examination. Michael got killed on the situation as far as tax. The accountant made a major error in advising Michael not to claim the office-in-home deduction. If he would have claimed the deduction, then those trips would not have been commuting. If the accountant would’ve researched Revenue Ruling 94-47, he would have seen an explanation as to why the expenses would not be deductible. The accountant did not consider all the possibilities. He thought it would be a red flag, instead it was a red flag that he didn’t claim the office-in-home deduction, because it was easy to see that he worked from home, and, therefore, the return was selected for examination, for the mileage expense and not for the office in home, because the IRS computer was programmed to say, “It’s probably going to be commuting expenses.” The law—code section 162, code section 280a(c)(1)A, code section 1245. Practitioners need to understand how an office in home can impact the deductibility of travel expenses, uses of vehicle, and make it commuting. Don’t hesitate to advise clients to take positions that even IRS would scrutinize. Instead, encourage clients to take every deduction to which they’re entitled to. Let’s look at another case study, rental to an employee. Andy does management consulting. He too works from home. He set up an S corporation. He was debating where to locate his business. He decided that, while he wanted to have a favorable impression, it would be more economical to have an office at home. The tax practitioner instructed Andy about the requirements for an office at home. He needed a space; expenses should be reasonable. So, he took the office-in-home deduction. The practitioner also recommended that his own S-corporation pay rent for the use of his personal residence. Andy would pick up the rental income on Schedule E of his tax return. He would then claim the mortgage interest and real estate taxes. The specific business expenses such as utilities and other similar items. Andy liked this idea because he was getting some tax benefits. In 2012 and 2013, Andy paid rent and filed his returns reflecting income expenses on Schedule E. It sounded right. In 2014, Andy had his returns selected for examination. The tax practitioner said, “No need to worry. The IRS examiner disallowed the depreciation on the rental property.” Andy said, “Well, that’s not right. I’m picking up the income. I should be entitled to expenses.” The tax auditor cited code section 280(c)(A)(6), which states that deductions for depreciation are not allowable for the rental of an employee’s personal dwelling to his employer. In this situation, Andy is a shareholder employee. He was not eligible to take the deduction, and it doesn’t matter if you rent to IBM. It doesn’t matter if you rent to Microsoft. If your employee pays your rent, you cannot take the deductions of Schedule E. You can’t take the utilities. Code section 280(c)(A)(6) applies in this situation. Mistake! The practitioner tried to save Andy money, but they should have researched 280(c)(A)(6). There are some ways that the rent could have been deductible. Could have rented separate space, could have acquired its own office building or condominium. But, they decided to use space in a personal residence. Code section 280(c)(A)(6) applies in this situation. You cannot take the expenses when you’re working for an employer. That’s part of 280A. The law—code section 280(c)(A)(6). When you’re deciding, make it the right decision where it should be. Practitioners should encourage clients to claim the office-in-home deduction, but do it right. Watch the rent that’s being paid because it could be a problem. Code section 280A discusses personal use of a residence and vacation home limits deduction of a taxpayer who is using property as a residence during the year. You must determine if the personal use was excessive. If a taxpayer uses property for even one day of personal use of a residence, you have to make an allocation of what the expenses are. There are no limitations on those other expenses that you’re carrying over to the vacation home, the interest taxes and casualty losses. If a taxpayer used the unit for personal purposes for the greater of 14 days or 10% over that amount, the portion that it’s being rented at fair market value is being treated as a personal residence. If the taxpayer uses the unit for personal purposes for less than 14 days, it is not considered a residence. It’s not considered a residence, but the expenses must be allocated. Here’s a relief provision. If the property is rented for less than 15 days, and you receive rent for it, you’re not allowed to take any expenses. But also, you do not have to include any income. There is this thing now, I believe it’s called Airbnb, where people are renting out their homes to people who are vacationing. If you rent less than 15 days, you receive rent for it. No expenses, but no inclusion of income. This is a good tax savings for a person who needs some money, who does some traveling. Keep it under the 15 days. This is the de minimis rule under 280A. Rental to a family member. The code section was changed in 1981. It was permitted the taxpayer will not be treated as using the unit for personal purposes if the unit was rented at fair value to any person for use as a personal residence. You’re basing fair market value rental based on comparable rentals, and whether the taxpayer made substantial gifts to family members. So restrictions to family members are included in 280A. Let’s go on to 280B. We’re dealing now with demolition. Taxpayers are permitted to take a deduction on the demolition as long as they didn’t intend to demolish it when they first purchased it. If they did intend to demolish it, you have to capitalize it, and it is not depreciated. In the court case, De Cou v. Commissioner, a court ruled that a taxpayer can take a loss on a building abandoned due to unforeseen obsolescence even though it was later demolished. They didn’t know it was obsolete when they acquired it. That is De Cou v. Commissioner. Revenue Ruling 95-27 clarifies this. A refurbished building will not be considered demolished as long as 75% of the external walls are still retained and 75% of the internal walls are maintained. Safe harbor allowed taxpayers to demolish significant portions of buildings, recognize a loss, and not capitalize as long as they maintained the requirements of the 75%. Code section 280C. Again, a whole bunch of stuff is buried in there. Disallowance of deductions where credits are available. Basically, what this is saying is a deduction in a tax-year for qualified research expenses must be reduced by credits. That makes sense. When expenses are capitalized, the amount capitalized must be reduced by any credit that you’ve gotten upfront. That’s simplistic. However, you have an alternative. Reduce the credit instead of reducing depreciation. You make an election with the filing of the return up to the due date of the return. Use a Form 6765. You have a choice. Do you reduce the credit? Or do you reduce the depreciation? Choices. That’s why I like the American tax system. We have choices. The government doesn’t tell you how to file a return. They tell you to file a tax return. There are a lot of choices in depreciation, net operating losses, use of vehicles, capitalization of expenses. You’ve got choices. Next one is 280F, luxury automobiles. If you’re driving a car in 2014 that costs more than $15,800, it’s a luxury automobile. That’s right. It’s a luxury automobile. Trucks and vans that qualify as passenger trucks and vans can go up to $17,300. Again, limitations on what they’re able to deduct. Another provision of 280F: for property not used more than 50% of the year in business, there are limits on your depreciation. You have to use specific, delineated IRC 168(g) alternative depreciation. Any excess depreciation will have to be recaptured if you claimed excess. Again, limitations where it’s not used at least 50% in business. Golden parachute payments, 280G. What does this have to do with all of the other subjects? Again, they didn’t know what to do, so they buried it in this code section 280. In very general terms, golden parachute payments are compensation payments made by a corporation to its employees, officers, or the controlling individuals of an organization, and they are obviously deductible. However, Code Section 280G disallows the deduction for certain types of payments made to disqualified individuals when it is paid pursuant to a change of control, specific changes of control. They label this as an excess parachute payment. I hate the term “disqualified individuals.” I work with nonprofit organizations, and they refer to board members or the executive directors as disqualified persons. I remember once someone contacted me and said they have to resign from the board. I said, “Why do you have to resign from the board of your organization?” They said, “I’m a disqualified person.” I said, “That’s what a board member is! It’s a person in a position of power.” Why don’t you just call it a person of power position or something, instead of a disqualified person? Well, they didn’t know what to call it, so they called it a disqualified person. Under IRC code section 4999, if an individual receives this payment that is considered a golden parachute payment, an excess parachute payment, the individual who receives it will have to pay a 20% excise tax on the amount. The amount would have been includable in income, so the entity that paid it loses the deduction. When does 280G apply when it’s paid to a disqualified individual? When there is a change of control, major change in control, and the amount of the payment equals or exceeds three times the annual average compensation from the corporation or related entities for the five years. So you have to do a computation. It’s not just giving them a simple bonus. It’s giving them this huge payment, which is greater than three times the average annual compensation that they receive for the five years preceding the change. That could be a lot of money. Who is a disqualified individual? An officer, a shareholder, when we pay off the shareholders, or a highly compensated individual. What is a highly compensated individual? It’s an individual who has an annual salary of at least $115,000. I don’t know how they came up with $115,000. They just said, “This is a highly compensated individual.” Or it is a person who is a member of a group consisting of the highest paid 1% of the employees of the corporation, or if less, the highest paid 250 employees of the corporation. Limitations…These are disqualified persons that this would apply to. Payment could include the following: bonuses; severance pay, continuation of fringe benefits, maybe giving them 10 years of fringe benefits; distribution of deferred compensation, stock awards, and a whole bunch more. Huge payments. Exceptions to this 280G liability where payments are less than three times the base amount. Control. Sale of just a subsidiary is not a change of control. They’re selling just one part of it, and if they give a payment, that’s not part of the excess benefit. Employee benefit plan exceptions, qualified retirement plans, it doesn’t apply to S corporations, and it also does not apply in a situation where 75% of the shareholders approve the compensation. And there are specific guidelines as far as the number of people. So if the shareholders approve it, it’s okay. That’s 280G, the golden parachute payments. The last part is 280H, and I don’t know why they buried this in here. Amounts paid to employee owners of a PSC, personal service corporation. The general rule is in regard to an election by a corporation under code section 444 to have a fiscal year. For that year, if the corporation does not make the minimum distribution, the deduction as far as the amount of compensation is limited to what it would be with a personal holding company. Now, if the corporation can’t deduct all of it, they can have a carryover of non-deductible amounts, but not a carryback. It doesn’t create a net operating loss. Okay, I probably confused you a little bit about code section 444. Code section 444 normally occurs with an S corporation. IRS is not excited when an S corporation has a fiscal year. S corporations can make an election, but they have to follow the guidelines. The last case study will explain a little bit more about code section 444. Let’s look at it. Brumley Incorporated started business as a C corporation in 1994. They had an operating cycle that ended on May 31st. They had operated as a C corporation for 20 years and always filed timely their corporate returns. They never had any difficulties with the IRS. In 2014, Brumley decided to change from being a C corporation to an S corporation. Now, they knew there were some problems with making this election under 444, but they wanted to keep their operating cycle. They wanted to keep the same fiscal year. The company filed Form 2553, which is an election by a small business corporation to be an S corporation, and they filed Form 8716 to have a tax year other than the required tax year, complying with the guidelines of section 444. They filed both forms with the appropriate service center. They never heard from the IRS. Never heard regarding it, so their presumption was it was approved. The company filed Form 1120-S returns for three years, until the IRS took the latest year and said to the taxpayer, “We never approved your fiscal year request under 444. Therefore, you’re going to have to refile all of your tax returns on a calendar year basis.” They had six shareholders, which meant that all six shareholders’ income tax returns would change for each year. The company was very frustrated. They refiled 21 returns. Six shareholder returns and the S corporation return for each year. They thought that the IRS had approved the document, the filing of the 8716 and the 2553. There was a mistake. IRS has specific guidelines regarding elections under 444. The taxpayer should have followed up. The accountant should have followed up with the IRS and asked, “What’s the status?” If the service had denied the application, they would have had the right to request a letter ruling. They didn’t know about it. So what should they have done? They should have gone back to the IRS and said, “We made a mistake, but you also made a mistake by not notifying us. We have a right. Can you take us back to where we would have been?” IRS can do whatever they want. So that is what the taxpayer asked, and IRS said, “Okay we’ll take you back. We’ll deny it.” So they denied it. Then the taxpayer requested a letter ruling with the IRS. They had to pay a filing fee because it was after a 12-month period where the IRS can rule on the 444 election. And if you get a ruling that’s unfavorable, you can request a conference at the IRS Office of Chief Counsel, where you’ve got an excellent chance of being sustained. You have a much better chance with the IRS National Office than you do with the service center and the other offices. They want to give you the elections. The law is code section 444. The Treasury Regulations, 301.9100-1 – 3, are very clear describing the situation. Yes, the letter ruling does cost money, but why would you refile all those returns? Why would you do that? Can you charge a client for all of those returns? I don’t think so. You can’t do it. You’re going to have to eat it. Once an IRS error is brought to its attention, IRS should cooperate with the taxpayer to correct the mistake. I find a lot of situations where IRS makes mistakes, and what I do is, in a very diplomatic manner, in an assertive manner, explain to them that they didn’t follow their own existing procedures. The Internal Revenue Code, especially code section 280, is a potpourri of tax confusion. There’s no rhyme or reason to understand why they put all this stuff in there, but it’s there. There are a lot of tax planning tools that are in this code section. I spent a lot of time on marijuana because a lot of people are very interested in the taxability of marijuana and the deduction for expenses. I hope I have not made this too taxing for you. Again, taxation is fun because it changes. Taxation, to me, is a lot more interesting than cost accounting and other facets of accounting.